It’s practically a taboo for a car company, particularly South Korean carmaker Hyundai Motor, to hire a celebrity as the face of a new vehicle. It’s supposed to be all about the car, not the star. Breaking this unspoken rule, Hyundai Motor brought a global sensation -- Korean boy band BTS -- into its all-out efforts to promote the large SUV it launched last month, seeking a rebound for its global sales. But the Palisade is a car with a target market that goes beyond BTS’ young fan base, extending even to its young fans’ parents. It’s the ultimate family car, featuring advanced technology and a design that is both masculine and innovative. At first sight, the Palisade is a big car -- unbelievably big compared with the compact sedans that were synonymous with Hyundai for so many years. Amplified by a large cascading grille with the big “H” logo in the center and an innovative vertical display of LED headlamps, the Palisade’s front facade clearly demonstrates that the 51-year-old carmaker is breaking away from its long-standing image as a traditional sedan-maker. The bold design -- illustrated by the presence of both horizontal and vertical lines -- shows the carmaker’s audacity and confidence, signaling a big shift from its former obsession with elegance and sophistication. Former Bentley designers Luc Donckerwolke and Lee Sang-yup, the team behind the Palisade, say it marks a new beginning for design at Hyundai. 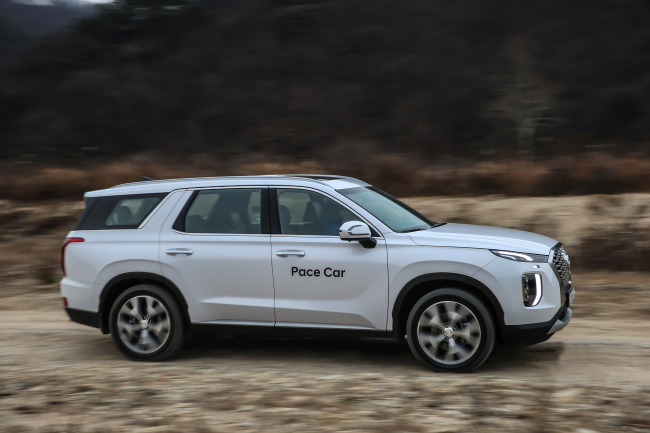 Summarizing their vision as “sensual sportiness,” Lee said at a test-driving session last week that his team would continue to recreate the “Hyundai look” in each new vehicle. This doesn’t mean adopting common design elements for every new vehicle to be launched under the Hyundai marque, but creating something uniquely Hyundai each time, he said. By using ivory as the main color inside, the designers tried to create a passenger cabin that is as spacious as possible. 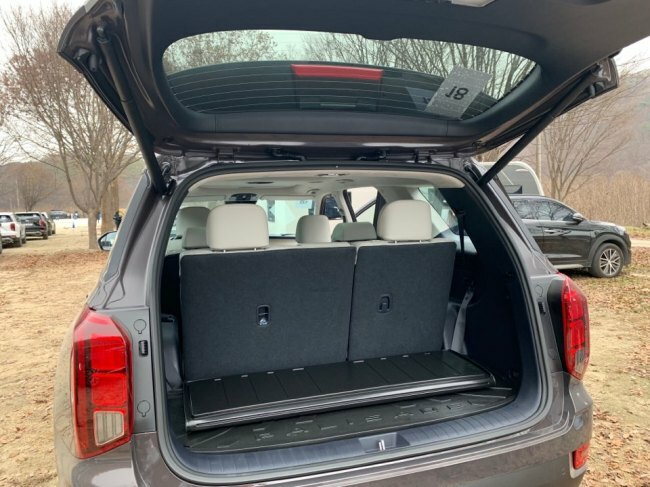 The SUV has eight passenger seats, nine air bags and even 16 cupholders -- enough for a weeklong family trip, perhaps. Like the Nexo, the carmaker’s hydrogen SUV, the Palisade features a “shift-by-wire” system -- that is, an electronic control system between the gear-shifting lever and the transmission -- so that the driver and a front-seat passenger have an unexpectedly useful space that is big enough for a small tote bag. Hyundai deployed a button-type gear-shifting lever to accentuate the SUV’s image as a high-tech vehicle. 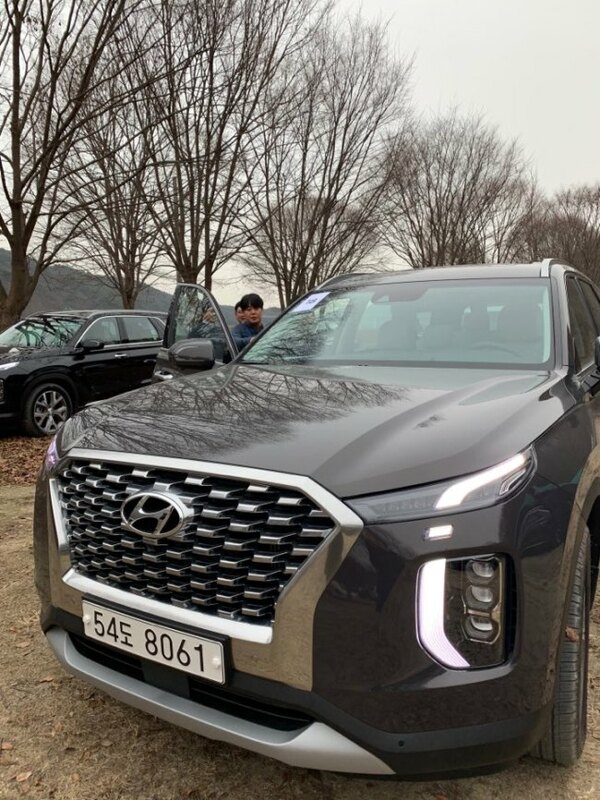 Driving Hyundai’s flagship SUV for 150 kilometers was quite surprising, not only because of its power but also because of its smoothness. The vehicle, which weighs more than 2 tons and is powered by a 2.2 diesel engine, glided smoothly throughout the two-hour test drive between the cities of Yongin and Yeoju, both in Gyeonggi Province. The speed went up easily to 140-150 kilometers on highways and could have been faster if the driver had had more courage -- and if there had been no speed-monitoring cameras. The only weak point might be its braking system, as it required a bit more force for the emergency brake to bring the 5-meter-long car to a complete stop. It offers three terrain driving modes -- snow, mud and sand – showing its versatility as an off-road vehicle. The Palisade handled 100-meter-long sandy and pebbled surfaces quite easily. But time limitations made it difficult to be sure whether it could weather more extreme conditions like muddy, wet and icy surfaces. In terms of space, the Palisade instantly brought to mind the idea of a road trip. Hyundai, by ditching its signature round arch-type rear design, made it possible to place three extra seats in the third row. They can be folded automatically for additional cargo space with an electronic system controlled by the front touch screen. If you fold the second-row seats too, there’s room for a bed big enough for two adults. In sum, it is difficult to associate the Palisade -- inside or out -- with the young, carefree image of BTS. It’s a perfect family car for those with children and who are planning frequent family trips, even for extended family groups, with safety and comfort guaranteed. The Palisade comes with an eight-speed automatic transmission powered by a 2.2-liter diesel engine or a 3.8-liter gasoline mill. The price ranges from 36 million won ($32,000) to 42 million won.